One of my favorite writing apps – FREE today. My Story – Book Maker for Kids is a great writing app for the iPad. The cost is normally $3.99 but it Is currently FREE. 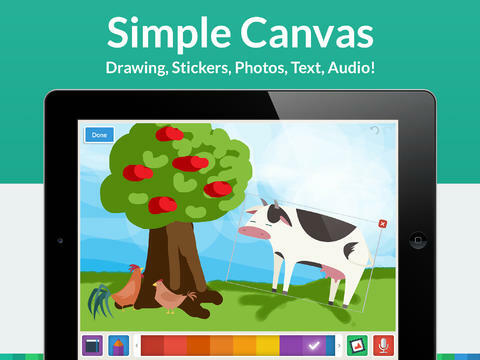 Kids can easily create then read an unlimited number of their own e-books using this app. Upgraded in March, the design has been simplified to make it easier for writers of all ages. Kids create their books one page at a time by typing in their text and adding their artwork. They can use a variety of mediums for their art – stickers, drawings (with pencils, paints or markers), camera photos, or pictures saved in the photo library. They can also record themselves reading their books. Finalized stories can read directly from the app, be published to iBooks, and/or shared via email with anyone who owns an iPhone or iPad. Watch the video and learn more about this app here: My Story – Book Maker for Kids. My Story is perfect for the classroom because teachers can add multiple authors and sync it across multiple iPads! Kids can share their stories with friends through iBooks, write and present digital reports, keep ongoing vocabulary books and/or journals etc. What a fantastic tool to encourage writing! Don’t miss this one! !